Employee productivity increases when ambient temperatures are comfortable and plummets when they aren’t. Error rates increase while safety is compromised when people aren't comfortable on the job. In a warehouse or manufacturing facility, a distracted, fatigued and uncomfortable person is at risk in hot, sweaty conditions. We lay out some of that data in our Warehousing Insights Blog. This issue is often seen as outside the purview of a warehouse manager, who is typically concerned with the operation, not environmental control. That's often left to operations and facilities management, who may not understand the impact of discomfort on productivity, errors and safety. With energy costs and the cost of lost productivity and safety concerns rising, it makes sense to review the avenues a warehousing or manufacturing operation can take to control temperatures. Even in cases where a known, controlled, temperature is advantageous but not essential, work may be carried out at room temperature. But very large, warehouse-type facilities may lack sufficient heating and cooling capabilities to maintain 'room temperatures'. Keeping conveyors cool: In facilities that have a good amount of conveyor, it’s important to control the effect of heat. Like any machine, conveyor is affected by heat. It’s a given that friction leads to heat, and conveyor systems have many friction points. In hot summer weather, the possibility of higher than normal temperatures combine with rotating conveyor parts to become a real concern. Heat also expands—another challenge that heat presents to machinery in general, and conveyors in specific. This article on conveyor and heat recommends some simple preventative maintenance to head off most heat-related conveyor operation issues. The recommendations include bearing seal checks, reducer oil periodic checks, keeping a close eye on motor overheating by using an ammeter, and watching conveyor belts for stretching or tackiness in extreme heat. Controlling temperatures isn’t just about air conditioning. Consider lower-cost alternatives such as high volume, low speed (HVLS) fans. These large, ceiling-mounted fans have been widely deployed in recent years because they provide significant comfort and productivity boosts for a relatively low cost. With very high ceilings and vast storage areas that are in constant flux due to stock and materials movement, warehouse and distribution centers face ongoing temperature control battles during the summer months—with or without air conditioning. When it's hot in facilities without A/C, slowly moving air breaks up the moisture-saturated boundary layer surrounding the body, accelerating evaporation to produce a cooling effect. HVLS fans used as a stand-alone cooling system can reduce the temperature to yield an effective cooling of up to 8° F less within the fan's coverage area (up to 20,000 square feet per 24' fan). Even in climate controlled facilities, HVLS fans reduce costs because slow and steady air flow can reduce or eliminate the need for costly and efficiency-reducing A/C duct work. Dock doors are typically the largest siphon on a cooled internal climate, constantly bringing sun-scorched air and heat into a cooler facility. Vinyl Strip Doors and Curtains control the environment of a defined area very efficiently. When installed on a frequently-used dock door, they keep the hot air outside and the cool air inside. The best thing is to keep dock doors closed when not in use, but that isn’t always possible. They’re also great for segmenting cooled areas from hotter areas. Besides the heating issues, they’re also good for helping to prevent dust or other airborne debris contained. They allow foot or motorized traffic to pass and can be configured for just about any size opening from a cooler door to a dock door. Doors aren’t the only place you might consider insulating. 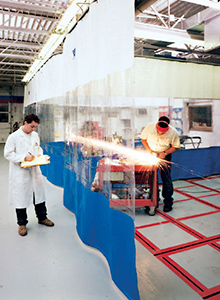 Curtain walls are perfect for welding areas, wash bays, and other “hot” areas within an otherwise cool facility. They allow you to segment your plant into various areas based on temperature, airborne debris, or work type. Curtain stations can be mounted directly to a ceiling, wall, or suspended from the ceiling. You can remove them and use them across your operation depending on the task or time of the year. When you can do that, they reward you with more and better work. You'll also have better morale, a safer operation and improved employee retention rates.